The William C. Friday Award, named for the former UNC president, honors Friday’s dedication and excellence in leadership, scholarship, character, and service, and recognizes individuals who emulate Friday’s dedication to those principles. The recipient of the William C. Friday Award is selected in part by the senior class of Park Scholars each year. Until his death in 2012, Friday himself provided input on the students’ nominees for the award. During his tenure as UNC President (2011-2016), Ross upheld the tradition by assisting the Park Scholars with their award recipient selections. The Park Class of 2017 named Ross as its William C. Friday for his commitment to leadership in education, public service, and student advocacy. Prior to becoming UNC President, Ross served as President of Davidson College, executive director of the Z. Smith Reynolds Foundation, director of the North Carolina Administrative Office of the Courts, and a Superior Court judge. Ross was appointed President of the Volcker Alliance in May 2016. He also serves as the Sanford Distinguished Fellow in Public Policy at the Duke University Sanford School for Public Policy. Ross has been involved in numerous civic and community activities, ranging from his current role on the Howard Baker Forum Cuba Consortium Advisory Board, to past board positions with the Center for Creative Leadership, the National Humanities Center, and the N.C. Biotechnology Center. 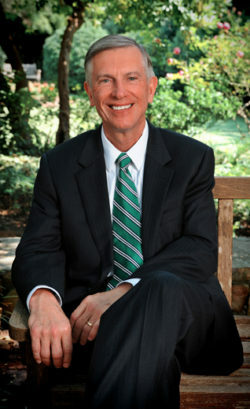 Among the many awards and accolades Ross has received for his public service and professional achievements are the William H. Rehnquist Award for Judicial Excellence (2000), given annually to one state judge in the nation; the North Carolina Chamber of Commerce Distinguished Public Service Award (2016); and the Echo Foundation’s Award Against Indifference (2015). Born and raised in Greensboro, N.C., Ross holds a bachelor’s degree in political science from Davidson College (1972) and graduated with honors from the UNC-Chapel Hill School of Law (1975). He is married to Susan Donaldson Ross, a former executive director of the Greensboro Bar Association. They have two adult children. Past recipients of the William C. Friday Award include NC State Chancellor Emeritus Larry Monteith, General Hugh Shelton, noted historian John Hope Franklin, Special Olympics of North Carolina CEO and President Keith Fishburne, Ambassador James A. Joseph, Red Hat CEO Jim Whitehurst, behavioral economist Dan Ariely, and CORRAL Riding Academy Founder and President Joy Currey.